Internet copy, telephone prompts, games and more…for clients around the world. She has a professional home recording studio and is a member of SAG/AFTRA with Financial Core Status. 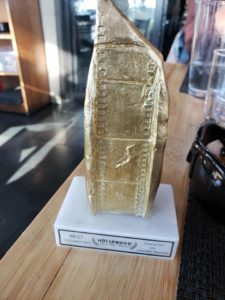 MY LATEST MULTI-AWARD-WINNING SHORT FILM! 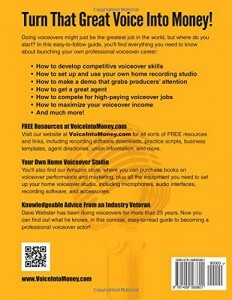 The “Go To” book for Voice Overs. Everything you need to know about equipment, required skills, agents, $$$, recording…& More! Finally—A Voice Over book that covers everything! I’ve been a professional Voice Over for 25+ years. Every week, I get a call or an email (usually from strangers) asking about how to get into the V/O business. From now on, I’ll save my breath and just have them purchase this book! Dave Webster details step-by-step how to set up a home studio—pictures, prices, brands, software, hardware, etc. Making demos (very important), websites, practice scripts, how to edit, how to find work. I can go on….but if you’re serious about getting into the V/O business….or you’re in it and want to get better at it—BUY THIS BOOK! It’s easy to read. Factual. Updated. Webster even has a website that is jam packed with helpful links, recommended products, downloads for practice scripts, etc. It’s a great companion to the book. Copyright © 2019 Diane Burket. All rights reserved.